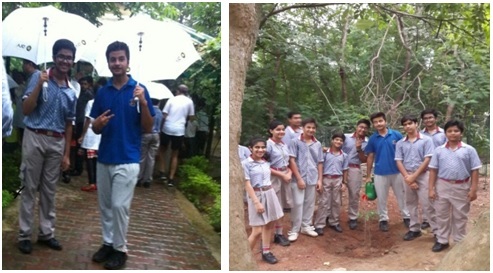 Fifteen students from classes VII – X embarked on a tree plantation drive on 6 August, 2016 at the Jahanpanah City Forest. This drive was initiated by the local MLA Mr. Saurabh Bharadwaj who interacted with the people of his constituency while making them aware of social issues such as the importance of planting more trees and keeping our city clean and green. The students greatly benefitted from this experience. Not only did they understand the importance of larger issues like planting more trees in our city, but they were also enriched by the experience of having interacted with a young and dynamic personality as Mr. Bharadwaj. They closely witnessed and had a glimpse of the life and work of the humble Gardener. The students also realized that they are not alone as a unit in their school but a part of a larger community with their neighborhood and surroundings.